You are here: Home / Blog / Cobalt Currents – Social Licence and Wild Catch Fishing – What is SL2O? Bring back the super-trawler… zzziiiip – can of worms being opened. Yes, FV Margiris is a graphic example of the power of social licence in our fickle hyper-connected social landscape. 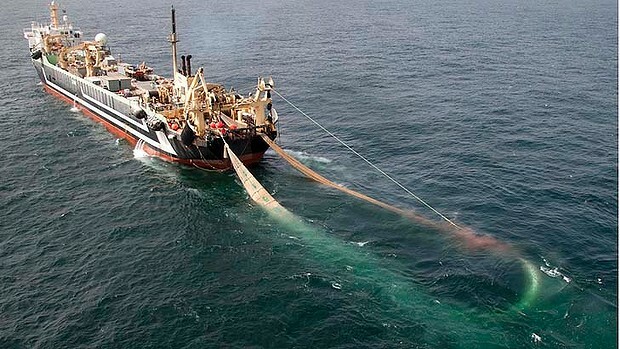 A form of social licence killed the super-trawler. It trumped well established science based fisheries management laws and policies, and flayed the fisheries managers working within them. It influenced some politicians so much they tripped over themselves changing the law to accommodate this changed societal norm. Except it probably wasn’t a changed societal norm. A fast and loose social media campaign, and a few doses of mis-information, just made it look like one. Science based fisheries management, a critically important platform for sustainable and profitable fisheries, was sidelined by a fast moving, emotive, and politicised public debate. And a level of business certainty for the fishing industry, secured in legislation, went missing in action. So this is number 1 in a 3 part series on Social Licence in the context of wild catch professional fishing. Part 1 – What is Social Licence? Part 3 – How do I get some, and how do I keep it? What is Social Licence to Operate (SL2O)? “A social licence to undertake a particular activity is granted by stakeholders, associated with the activity or the general community. It is the community approval to undertake a particular activity and is based on the beliefs, perceptions and opinions held by stakeholders in a resource or a project”. “like any primary industry the wild catch sector’s sustainability ultimately depends on what is ecologically possible, how well that industry generates benefits in excess of costs, and how consistent the industry’s practices are with prevailing social customs and norms – that is, its social acceptability”. Incidentally, this project will report preliminary findings at the biennial Seafood Directions conference at Port Lincoln in late October (FRDC project 2012/301). Regrettably one of the key bits of this definition is the based on the beliefs, perceptions, and opinions part. In effect it means that SL2O is a very dynamic, fluid and subjective concept. It changes over time, across communities, interest groups and regions, and from issue to issue. So much for clear goal posts and business certainty! The dynamic and subjective nature and potential power of SL2O make it a challenging beast to manage. Spawned in a fickle and hyper-connected social landscape, therein lie some strategies to deal with it. Regular if not constant monitoring, a finely tuned antennae, and adaptive management are a likely part of the answer. As well as a generic understanding of what constitutes acceptable environmental performance in the eyes of influential stakeholders (and the public at large); a more nuanced ability to monitor social norms; and respond early and effectively within that same context will be a key strategy (more on that in the 3rd part of this series). And if SL2O depends on environmental sustainability then the definition of sustainability becomes fundamental. And here’s another can of worms. While most fisheries management regulations and policies define sustainability to a large degree, and definitions of Ecologically Sustainable Development (ESD) are well established and largely consistent nationally; society’s definition of sustainability is fickle and often subjective. Genuinely sustainable professional fishing is a valuable activity, economically, socially and culturally; and clear definitions of sustainability and benchmarks for acceptable practice are vital. Clarity can help put some shape around social licence. Contemporary fishery harvest strategies – with clear target and limit reference points – are a great contribution. And to bolster fishing industry social licence at least cost, there’s an opportunity to leverage off sustainable fisheries assessments under the export provisions of Australia’s EPBC Act. These have been a driver of improved environmental performance in many fisheries, and a lot of time and money is spent on them. They could – and should – carry more weight in generating public confidence about fisheries sustainability. And let’s be clear, there are many very well managed and very sustainable, innovative and profitable fishing businesses in Australia. It’s a proud industry with a proud tradition. In my experience many of these businesses already have, or are fast developing a strong and valued reputation in their field, and their community. By strengthening their social licence they’re building a more resilient, valued and valuable fishing business. SL2O is a moving feast and compounds challenges in an already fast paced operating environment for the fishing industry. Increasing risks from climate change driven oceanographic changes, such as this graphic WA example, seismic testing for oil and gas exploration, and desalination plants are a myriad of cumulative threats to many marine ecosystems, and the productivity of many fisheries. Yet sustainable food production is becoming more and more important and social licence can be an important ally. Many fishing businesses are pushing back against social and regulatory pressures and business uncertainty, and asserting their value. They’re drawing the line. Societal or peer pressure, market advantages, and personal philosophical/ethical platforms are all drivers for improved environmental and business performance. And these non-regulatory drivers can be the most cost effective “management framework” of all. As examples, accurate catch and effort data generated willingly from commercial fisheries will improve fisheries management effectiveness and cost efficiency; and build community trust. And e-NGO assertions about commercial fishing impacts on the environment must be accurate and objective if they are to retain industry, public and government confidence in their judgement. Trust and respect underpin civil society and influence is often based on trust. Transparency should pay dividends, and earning trust from society – strengthening social licence – is a long term game. Great intro and overview of SL2O in the fishing industry context Andy – thank you. Now to Part 2!